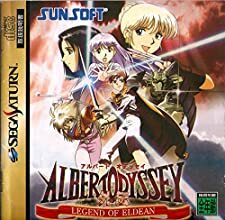 Albert Odyssey - Legend of Eldean is a RPG game, published by SEGA, which was released in the United States of America in 1997 for the Sega Saturn. Sega CD, Saturn, Dreamcast, Genesis lot of 25 games. Rare. Albert odyssey. Albert Odyssey Legend of Eldean + Iron Storm Sega Saturn Working Designs Minty! SEGA Saturn Spiel - Albert Odyssey: Legend of Eldean US CD mit Anl.